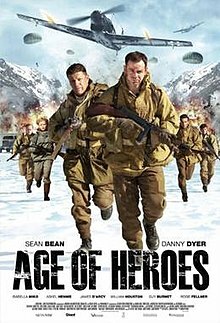 Brief Synopsis – A group of elite British soldiers are sent on a daring mission in Norway during World War II. My Take on it – This is an interesting film that is presented as fact yet they don’t hit the viewer over the head with it too much. The plot works quite well and they keep the story paced perfectly in order to make sure that there are no lulls in the action or in the way that the story plays out. They don’t manage to develop the character much more than superficially, but in this kind of film that actually helps because it is fast paced and filled with action. Love the way that they subtly meet with the famed author Ian Fleming who helps create this elite force and then wrote about super-spy James Bond years later based partially on his own knowledge of what are required from spies during wartime. That being said, we still get a clear idea of who each of the characters are as they embark and take on this dangerous yet imperative mission. Sean Bean does a nice ob as the team leader and we get to see numerous sides of his character as he is tormented between caring for his men, his country and ultimately his family. Bottom Line – Interesting film that has roots in fact but doesn’t pound it into us. The plot moves along quite well and they keep things paced perfectly so that there are no lulls in the storyline or action. The characters aren’t developed very well yet we get a clear enough sense about who they each are as the mission moves forward. Bean is quite good here as the commander of the mission as he tries to get the most from his men in order to complete their task. Recommended!